Flinders and his uni. Michael Coghlan. There seems little doubt that Cook was one of the greatest seafarers Great Britain has produced. He made three trailblazing scientific voyages into the Pacific Ocean, each of well over two years in duration, and his career was tragically cut short when he was killed in Hawaii in February 1779. During those three voyages, he charted large parts of the world’s largest ocean, and he and his teams of scientists made lasting contributions to geography, natural history, astronomy, oceanography, and philology. He also made practical contributions to seamanship, keeping his crew alive during those long voyages by promoting cleanliness, providing ventilation, and implementing a healthy diet including sauerkraut and an extract of citrus fruit. But what has Cook to do with Australia? He was not the first European, or even the first Englishman, to set foot on the continent. He was the first to explore our east coast, but this was a minor part of his total activity, and not really what his fame rests upon. We tend to exaggerate his significance to us in Australia, perhaps because he is a good hero to be able to claim, but of the time he spent doing the things for which he later became famous, he actually devoted very little of it to our continent. Out of the nearly nine years in total he spent on his three famous Pacific voyages, Cook spent only about three months, that is about 3% of that time, exploring the coast of what he called New South Wales. He spent very much more time in New Zealand, which indeed he did circumnavigate. After he ‘discovered’ our east coast, Cook returned to the Pacific Ocean twice more on extended voyages, but he never again set foot our continent. So, how important was he really for Australia? Or Australia for him? The recommendation of Botany Bay to the British authorities as a suitable site for a convict settlement came from the botanist Joseph Banks – who had travelled with Cook – not from Cook himself. Also, we need to remember that, while Cook’s voyage was indeed remarkable, it was not unique. Between 1764 and 1795, at the height of the Enlightenment, there were 24 similar voyages of scientific discovery made by European nations to various parts of the world. As every schoolboy knows, a French scientific expedition sailed into Botany Bay only a few days after the arrival there of the First Fleet in 1788. Moreover, during the same period, inland expeditions were conducted, such as that of Alexander Humboldt in South America, of at least equal significance. If Cook was a sail-in/sail-out tourist, Matthew Flinders came to New South Wales armed with a work permit and a desire make a significant contribution to the new colony. He had joined the Royal Navy after being inspired to become an explorer by Daniel Defoe’s Robinson Crusoe, and his first journey to the Pacific was as an apprentice to another Australian colonial icon, Captain William Bligh. When he arrived in New South Wales in 1796, he immediately set off in a small boat to explore the coasts adjacent to Port Jackson, often with his surgeon friend George Bass. Given command of the sloop Norfolk, he further explored the coast north and south of Sydney, and circumnavigated Tasmania to prove it was an island. He then returned to England, hoping to mount an extensive naval exploration of New Holland, as the western part of the continent was then known. He gained the support of Joseph Banks, now President of the Royal Society, and even of King George III, and was given command of the 334 ton vessel HMS Investigator. Flinders set sail again for New Holland in 1801, and after landfall in what is now Western Australia, proceeded gradually eastward, charting and exploring the southern coast of the continent, including the Great Australian Bight, Spencer Gulf, and Kangaroo Island in what is now South Australia. It was there that he had his famous meeting with the French explorer Baudin in the inlet he called ‘Encounter Bay’. After sighting Mt Gambier and entering Port Phillip, where he climbed to the top of Arthurs Seat, he eventually arrived in Sydney on 9 May 1802. He refitted and provisioned Investigator, and in July 1802 set off north up the Queensland coast, where he amended Cook’s charts, and sailed around Cape York into the Gulf of Carpentaria which he surveyed during November to February 1803. Unfortunately, his ship was found to be leaking, and close examination revealed that its timbers were so rotten it would not stay afloat for long. Flinders was determined to finish his circumnavigation, but reluctantly had to abandon the time-consuming costal survey work. With fingers crossed, he travelled west, then south down the Western Australian coast, then east again, and finally reached Sydney on 9 June 1803, the first to circumnavigate the continent. Flinders would have undoubtedly added many more exploratory exploits to this catalogue had the Napoleonic Wars not broken out, leading to his long imprisonment in the French colony of Mauritius, where he had called in on the way back to England. Unlike Cook, who was briefly on our east coast just once, Flinders devoted most of his working life to the exploration and charting of our continent, and spent important time in every Australian state. Not only that, but on his circumnavigation voyage, he took with him the indigenous man Bungaree, who thus became the first First Australian to circumnavigate Australia. So, Flinders has a connection with aboriginal Australia, as well. And, perhaps even more significantly, although he didn’t coin the term, Flinders was the person who first seriously proposed naming the new continent ‘Australia’. Until that point, the eastern half of the continent was called New South Wales, and the western half New Holland. Flinders’ support for the inclusive name was decisive in the Admiralty decision to designate the continent Australia. Cook may have been a hero, but he was not our hero. Charting part of the coast of New South Wales was a minor aspect of his achievement. The Prime Minister’s enthusiasm for him is misplaced. 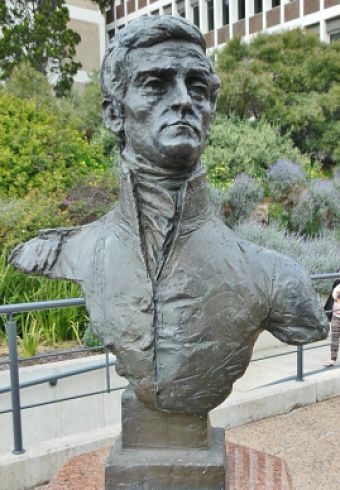 Exploring and surveying Australia’s coast was Matthew Flinders’ life work. If anyone deserves to be honoured by a replica sailing vessel circumnavigating Australia, it should be Matthew Flinders, who actually did it in his ship Investigator. And who did so much more, besides. Ian Robinson has been a tutor in political philosophy at the University of Melbourne, a lecturer in philosophy and educational theory at Coburg Teachers College, and head of Professional Writing and Editing at Chisholm TAFE. His articles have appeared in the Age, the Australian Rationalist (which he also edited for a number of years), Free Inquiry, and Philosophy Now. His full-length plays The Process and Godot: The Wait is Over recently had successful seasons at La Mama Theatre in Melbourne. This article is reprinted from JohnMenadue’s blog, Pearls & Irritations.